Explore the fertile Valley, known to be a world-class wine region like those in France and Italy and/or visit a lush haven of the Dandenong Ranges' secret fern glades, towering forests and eclectic villages. The vast Royal Botanic Gardens are considered to be among the finest in the world. 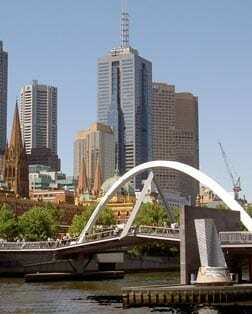 Located on the southern banks of the Yarra River just 5 minutes from the bustling city. Step back in time and experience Australia's exciting gold rush days. Pan for gold and explore this award-winning, interactive outdoor museum that recreates the hustle and bustle of 1850s life. Experience a distinctly Australian wildlife experience. Get close to over 200 species of native wildlife, including platypus, koalas, emus, Tasmanian devils, lyrebirds and wombats in a bush setting. This century-old train is one of the most popular steam heritage railways in the world. It still runs on its original mountain track in the scenic Dandenong Ranges, just as it did in the early 1900s. Opened in 1878, this huge open-air market is a Melbourne institution. You'll find a wide array of goods amongst the "sheds," from fresh produce and meats, to clothes, housewares, and souvenirs.